Build the box you need with Arlington's UL Listed, economical gangable concrete floor box. Single gang, non-metallic boxes lock together to create a two- or three-gang box that accommodates a PLASTIC cover (5 colors) or zinc with brass or nickel finish. Best of all, covers install with the hinge on either side. Convenient and economical! 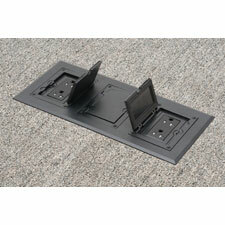 Here's how Arlington's interlocking gangable floor box works. Build the two- or three-gang concrete floor box you need by simply locking single gang boxes together. Connections on opposing sides allow single-gang FLBC8500 or FLBC8502 boxes to lock securely together. Lock two boxes together for a two-gang box. Add another single gang box to make a three-gang box. The FLBC8500 box has (2) built-in 1-1/4" hubs; FLBC8502 offers (2) 2" hubs. Both come with (2) blank plugs that double as additional hubs. After building the box select the frame/cover kit that fits: single, two- or three-gang – in PLASTIC (black, gray, brown, caramel, light almond) – or diecast zinc with brass or nickel finish. The cover kits include 20A decorator-style receptacle(s) and low voltage insert(s) so you’re all set. Fast and easy installation in new concrete. Install the frame on the box. Add the devices, then attach the gasketed plastic or metal cover to the frame. For even greater flexibility the covers for Arlington's interlocking boxes can be installed with the hinge on either side.